This strawberry is one tough cookie! It's a super-sturdy variety that thrives in all parts of the country, and will hold up to even the worst winters without mulch. 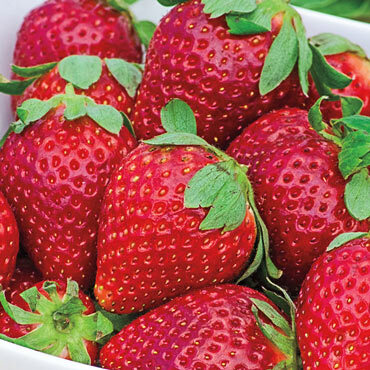 Fort Laramie strawberries produce a fair amount of runners, and huge crops of bright scarlet berries that are absolutely bursting with juice. Their honey-sweet flavor is excellent fresh and for use in jams, jellies, preserves, and desserts of all kinds. Try planting with our easy-to-use Grow Tub™ Tiered Strawberry Planter. For the best, biggest berries, plant Fort Laramie in moist, well-drained, slightly acidic, sandy loam soil in full sunlight. Self-pollinating. Zones 3-7. Zone: 3 - 7 (-30° F.). Depth: Set with crowns just below soil level (where the roots meet the leaves). Fruit: Large to very large, bright scarlet fruit; dark pink to scarlet interior. Soil Preference: Moist, well-drained, slightly acidic, sandy loam soil.